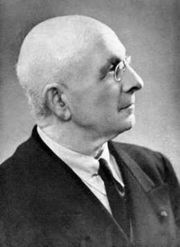 Alexis Marie Joseph Auguste Carrel-Billiard (Lyons, France 1873 - Paris 1944) French surgeon, biologist and eugenicist. He was awarded the Nobel Prize in Physiology or Medicine in 1912. Alexis was educated at home by his mother Anne Ricard, and also at St. Joseph School, Lyons. In 1889 he took the degree of Bachelor of Letters at the University of Lyons; in 1890 the degree of Bachelor of Science and in 1900 his Doctor's degree at the same University. In 1935, in collaboration with Charles Lindbergh, the airman who was the first to flow across the Atlantic, he devised a machine for supplying a sterile respiratory system to organs removed from the body. Carrel, in collaboration with Theodore Tuffier, performed on the heart a successful series of valvotomies. He is considered the father of organ transplants and open heart surgery. He also wrote in 1941 "Reflections on life". Carrel was honoured by memberships of learned societies in the US, Spain, Russia, Sweden, The Netherlands, Belgium, France, Vatican City, Germany, Italy and Greece, and by honorary doctorates of the Universities of Belfast, Princeton, California and New York, and Brown and Columbia Universities. He was a Commander in the Legion d'Honneur of France and in the Leopold Order of Belgium, a Grand-Commander in the Swedish Order of the Polar Star. The lunar crater "Carrel" was named after him as a tribute to his scientific achievements. Carrel, Alexis The Columbia Encyclopedia.